Russia’s Olympic organizing committee to pay for food and housing for the 29,000 expected for the 2014 games. The organizing committee for the 2014 Sochi Olympics has not yet announced the budget for taking care of volunteers, but their living and working conditions are already known. The organizing committee’s press office has announced that during the 2014 Games, all volunteers will live in specially constructed apartment houses. In addition to their accommodation, the organizing committee will pay for volunteers’ food, provide them with uniforms and transport them to and from their places of work. The volunteers are only responsible for getting themselves to and from Sochi. The volunteers for the London games were not provided with such comforts. The approximately 70,000 volunteers who worked at the 2012 Games had to provide their food and accommodation themselves, although the organizing committee of the London Games did provide transportation and a uniform. In justifying the additional expenditures on volunteers, the Sochi organizing committee argued that most of the volunteers for the 2012 Games lived in London, while they anticipate that nearly all the Russian volunteers will come from outside Sochi. Most of the people applying to volunteer at the Sochi Games are between 17 and 22; in contrast, to volunteers at the London Games were mostly between 29 and 40. Sochi will have fewer volunteers than London (29,000 compared with 70,000), but they will have more responsibilities. The fact that Russia is hosting the Winter Games means that the Olympic helpers will have to clear away snow and “break in” some of the sports sites – for example, by testing the ice on the skating rink before the events start. Because of the difference in seasons, the Russian volunteers will receive a different set of clothes. In London, they were issued with a jacket, a cap, a watch, a bag, a water bottle and an umbrella with the Games logo, and also souvenir badges and a diary. The Sochi kit will include a jacket, thermal trousers, a hat, gloves, thermal underwear, a polo shirt and T-shirts. 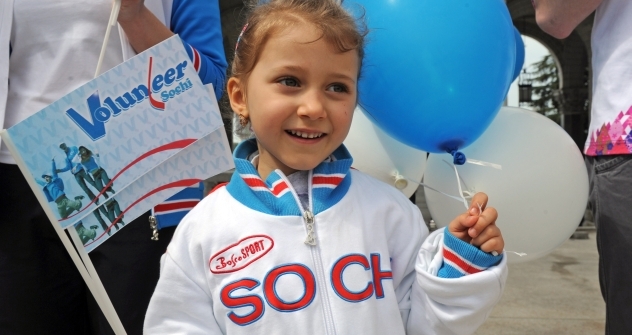 Overall the London and Sochi volunteer programs are organized on the same principles. A shift is eight or nine hours. In their free time, the volunteers can visit the Olympic events. Of course, there are more of such opportunities for those who are working right on the sports sites: these volunteers can watch the events right where they are working, while others are given tickets as an incentive. Another bonus for the Olympic volunteers in London is that their involvement in the Games could have a direct effect on their career. Their experience of working at the international competitions can be an important line in their CV. Personnel managers in Russia believe that the Sochi volunteers won’t reap as much benefit from having a volunteer experience on their resumes. “This experience is primarily suitable for representatives of the liberal professions,” said Svetlana Belova, HR business partner with the Imperia Kadrov recruiting company. She noted that having this experience could be useful for event managers, translators, journalists, secretaries, administrators and clerical workers who want to work for international companies. Russia’s Public Chamber is preparing to send a bill to the State Duma that will establish the rights and responsibilities of volunteers. Such as, when a contract should be signed between the volunteer and event organizers; whether the volunteer or the organizers hold responsibility for accidents and in what cases the organizers should reimburse the volunteers for their expenses and on what basis. This law could make it easier for volunteers to benefit from the experience in the future – they will have a contract to show their potential employers. This article can be read in the original Russian in the Izvestia newspaper.